Every state in the country has very strict guidelines regarding the legal usage of a dealer license plate or D-tags. Most states only allow dealer license plates to be used by an owner, officer, employee of the dealership, or by a customer that is test driving the motor vehicle. Most states do not allow a dealer license plate to be used anyone that is not affiliated with the dealership and they are never to be used to avoid the payment of sales tax. You may normally only place a dealer license plate on a vehicle that is held for resale by your dealership. Most states do not allow you to place a dealer license plate on a vehicle that has already been sold. You may never place a dealer plate on a truck that is pulling other vehicles or on a loaded trailer. It would be very convenient to purchase a ¾ ton truck, place a dealer license plate on it, and then haul trucks back and forth from an auction. But this is not allowed in any state. If you place a dealer license plate on a vehicle you must be constantly attempt to market and sell the vehicle. If you are pulling vehicles behind a truck with a dealer license plate the truck is not being marketed at that time. If you use a truck to transport your vehicles to and from auctions, you will need to pay taxes, title & license fees and place the truck in you or your dealership’s name. If you stack several trailers on top of another trailer when transferring them to your dealership you cannot place a dealer plate on the bottom trailer. In this case the bottom trailer will need to be licensed in the dealership name because it is now a dealership service vehicle. I once observed a large truck with a dealer license plate on it pulling a flatbed trailer full of ATVs. The flatbed trailer also had a dealer license plate on it. If the dealer driving the truck would have been caught, he would face two violations of dealer license plate usage along with severe financial penalties. Dealer plates usually may not be displayed on any motor vehicle, trailer, or boat that is hired or loaned to others on any dealership service or wrecking vehicle. 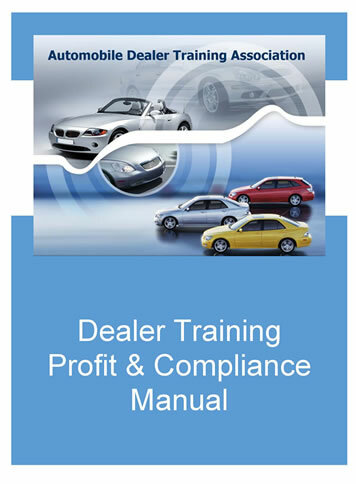 When I give dealer training seminars people often ask “Can I buy a vehicle, drive it six months with a D-tag, then sell it?” Never! If you purchase a vehicle and place a dealer license plate on it with no intent to immediately sell the vehicle, you are avoiding the payment of sales tax on the vehicle, which is not allowed in any state. People in my dealer training seminars also ask questions like “Can my wife or husband drive my demos down to Wal-Mart with a dealer license plate?” This might be legal in your state if your wife or husband is an owner, officer, or employee of the dealership certain guidelines are met. If a law enforcement officer sees the vehicle parked at Wal-Mart with a D-tag, it could be considered curbing, which is illegal in most state. You must only place a dealer license plate on a vehicle that is being held for resale. I often hear the comment “I am going to get rid of my personal vehicle and just drive my demos”. Driving demos as personal vehicles is not allowed in most states. If your state finds out you don’t have at least one vehicle licensed in your name that is not part of your vehicle inventory, you could face severe fines. Your state may even require you to pay the back sales tax on the demo you have been driving as a personal vehicle the last few years. If you get into the habit of driving your demos as personal vehicles you are essentially avoiding the payment of sales tax which is prohibited in every state. Vehicles that you hold for resale are not allowed to be driven as your personal vehicles. Most states allow a dealer license plates may be used and displayed on vehicles in parades, private events, and charitable events. You also need to be aware that thieves love to steal D-tags. D-tags are the most common type of license plate that is stolen so you must take measures to protect your D-tags from theft. Many dealers like to use a large D-tag magnet that you can attach to your dealer license plates which allow them to be placed on the trunk during the test drive. I rarely use these magnets since it makes it so easy for a thief to grab the D-tag and walk off. A D-tag magnet also tends to scratch your trunk every time you hit a bump. I like to use a pair of small plastic screw tabs that make it easy to put the D-tags on before the test drive, and then remove the D-tag immediately following the test drive. Never leave your D-tags on your vehicles, take them off when not being used and store them in your desk or other safe place. You can never loan out a D-tag. I have lost count of the times a relative or friend has asked if they can borrow a D-tag. You can’t allow someone to place one of your D-tags on a vehicle that is not part of your inventory. Doing so would lead to a dealer license suspension or revocation in nearly every state. You also need to know where your D-tags are located at all times. If your state dealer license bureau ever conducts a surprise inspection they will require that you can account for all dealer license plates in your possession. If you cannot account for every dealer license plate that you own, you may face substantial fines from your state dealer license bureau. Failure to use dealer license plates as per your state regulations can result in dealer license suspension or permanent revocation. Be sure to consult your state dealer license bureau for correct dealer license plate instructions.